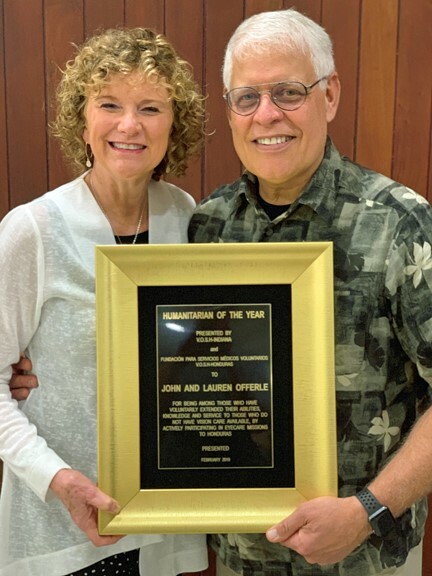 MARCH 2019: Dr. John and Laurie Offerle Named "Humanitarian of the Year. Congratulations to our Dr. John and Laurie Offerle on their well-deserved honor of being named "Humanitarian of the Year" by VOSH Indiana! VOSH is a non-profit group of eye care professionals who donate their services to populations throughout the world who otherwise would not have access to care. The Offerles have been volunteering in annual mission trips for almost two decades, and received the award during this year's mission to Honduras. Along with other members of the Volunteer Optometric Services for Humanity (VOSH) team, they cared for up to 800 patients per day, and corrected vision for thousands with donated eyeglasses and sunglasses. Volunteer eye surgeons who also traveled with the group restored sight to those suffering from cataracts. Dr. Offerle says vision loss due to cataracts is a disease of poverty and accounts for half of the world's blindness. He finds the mission trips to be incredibly rewarding, and refers fondly to a Honduran trip shared with his daughter Dr. Kristi a few years ago. "It makes you appreciate what we have," he says. "We are so blessed to practice with such great equipment ... can counsel our patients about diet ... and have so many opportunities that these Hondurans don’t have." INTRODUCING THE ULTIMATE LENS PACKAGE AND SPECIAL BOGO OFFER! The Ultimate Lens Package brings together three innovative technologies to deliver your best vision, clarity, and protection in one pair of lenses. Now through December 29, 2017, purchase an Ultimate Lens Package and get a second pair of qualifying lenses FREE with the purchase of a second pair of frames. Choose your second pair from a wide range of lens options, including polarized sun lenses. Ask one of our optical staff members for more details. November 2018: Save the Date! 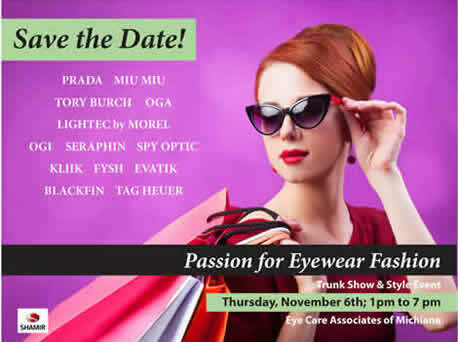 November 8th | Passion for Eyewear Fashion Trunk Show & Style Event! Explore the largest and most unique frame selection from around the world at our annual fall trunk show & style event! Enjoy prizes, raffles for free frames, refreshments, and discounts up to 50%! This year's exclusive trunk show collections include: ZIGGY, Blackfin, Jean Reno, Kliick:denmark, Fysh, Evatik, Mad in Italy, Coco Song, Dutz, Ella Laguna Beach, and more! 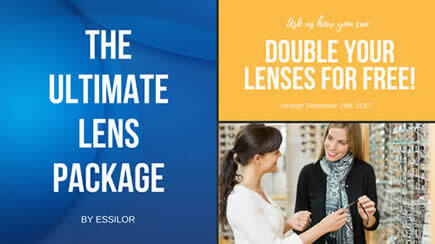 The Essilor Ultimate Lens Package will also be offered for additional savings. Eyewear is your personal statement. Let us help you make a great one. Join us! No appointment necessary. Non-patients and friends welcome! For a limited time, you can purchase the Essilor Ultimate Lens Package and get a second pair of qualifying lenses on us with the purchase of a second pair of frames.† You may even be able to use your vision insurance benefits for even more savings! Speak with one of our optical staff members for more details. Hurry in! Offer expires December 31st, 2018. April 2017: Dr. Linnea Robbins-Winters named Indiana "Optometrist of the Year." Dr. Linnea Robbins-Winters was named the 2017 Optometrist of the Year by the Indiana Optometry Association (IOA) at its 120th Annual Spring Convention Awards Luncheon at the Sheraton Indianapolis Hotel at Keystone Crossing on April 21st. The Optometrist of the Year award is the IOA’s highest honor and is bestowed upon the member who has demonstrated not only contributions to the optometry profession, but also service in behalf of the visual welfare of the public and service to the community at large. Dr. Robbins-Winters has been caring for the vision needs of families in the Michiana area since 1992, and is a partner in Eye Care Associates of Michiana with offices in South Bend and New Carlisle. 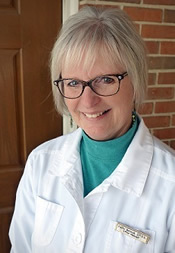 She has served in elected leadership roles with the IOA, as an appointed advisor by Indiana Governor Kernan to the Indiana Optometry Board, and as a member of the Vistakon Leadership Advisory Panel. Locally, she provides free vision screenings to area school children, participates as a provider for the non-profit Vision USA program, and is a spokesperson for InfantSee, an organization that provides free eye examinations to infants six months to one year of age through participating optometrists. Bask in the selection and the savings during our largest one-day trunk show of designer and sport sunwear for men and women! Frame representatives will be at our South Bend office presenting their full collections from Giorgio Armani, Salvatore Ferragamo, Versace, Ziggy, Jean Reno, Coach, Ray-Ban, Oakley, Nautica, Nike ... and for our youngest patients, the Disney collection. Enjoy giveaways, refreshments, and lots of fun! Receive $30.00 in TRUNK SHOW BUCKS to apply to your sunwear purchase just for attending! No appointment necessary. Friends welcome. February 2017: What's on the Agenda for Your Eye Care Team. The eye care team of ECAM will be participating in optical lens education during an upcoming Monday morning staff meeting. An Essilor lens representative will visit our South Bend office to present information on the latest developments in progressive (bifocal) lenses, as well as detail lens coating advancements for glare and eye-strain reduction. Our eye care practice is proud to qualify for the Essilor Expert program, as we continually strive to offer you the most knowledgeable assistance and latest lens products when serving your optical needs. Our eye care team will preview the Spring/Summer 2017 collection of Maui Jim sunwear when a local representative visits our office for a “lunch and learn” session. The Maui Jim brand is popular among our patients who appreciate superior optics and classic sunwear style. If you’ve never worn MJs -- be forewarned -- you will become a devotee once you do! February 2017: Introducing a Contact Lens Designed for Digital Life. Eye tiredness and dryness have become the "new normal" for many office workers and heavy digital device users. Your ECAM eye doctor is here to help, and has many options that can improve vision comfort, including the NEW Biofinity Energys contact lens from Coopervision. January 2017: Your Doctors' Calendars for 2017. Dr. John Offerle will be traveling to Nashville, Tennesee this spring to attend the annual meeting for Vision Source -- North America’s largest network of private practice optometrists. Opportunities for continuing education, practice improvement ideas, and new products and technologies will be offered. His personal travel includes a trip to Lafayette, Louisiana, where Dr. Offerle and his wife Laurie will spend a long weekend with friends who have traveled with them to Honduras and Africa on more than 10 volunteer missions for VOSH (Volunteer Optometric Services Humanity). Locally, he is looking forward to spending time with his grandchildren ages 2 and 3 at the family lake house. Dr. Kristina Offerle will be attending the Indiana Optometric Association’s Fall Seminar at Indiana University’s Bloomington campus. She will participate in two days of continuing education classes focusing on ocular disease management and updates in pharmaceuticals for eye disease. At this annual seminar, she plans on connecting with former classmates from optometry school. On a personal note, Dr. Kristina and her husband Chris look forward to vacationing this summer with the Offerle extended family and their dog Rocco at the Outer Banks, South Carolina. Dr. Tom Morton will be attending three educational conferences this year, including the Vision Source Exchange meeting with his partners Dr. Offerle and Dr. Robbins-Winters. Dr. Morton is looking forward to previewing new office and ophthalmic technologies as well as receiving updates in eye disease management. On the home front, Dr. Morton and his wife Carla after raising three children have become cycling enthusiasts. Last summer they covered over 1,600 miles, riding either their tandem or single road bikes. They look forward to doing more of the same this summer, and are planning a few “century” rides in addition to a biking excursion in Utah. Dr. Linnea Robbins-Winters will be traveling to Nashville, Tennessee for the annual Vision Source Exchange meeting with her practice partners. This meeting brings together a network of private practice optometrists who share practice improvement ideas while taking advantage of the many continuing education opportunities. Her personal calendar includes a spring break trip to San Diego with her daughter Jaiden (age 11), and a family golf vacation so she and her husband Joe can assist their daughter Jordan (age 14) prepare for her first year on the high school golf team. January 2017: Specialized OCT Testing Now Available at Our New Carlisle Office. Patients of our New Carlisle office no longer need to travel to our main office in South Bend to receive specialized testing for eye-health issues. The 3D OCT-1 Maestro by Topcon has arrived! It is a state-of-the-art diagnostic tool that uses high-resolution digital photography and the latest optical coherence tomography (OCT) to provide your doctor with important and highly detailed clinical information. The Maestro is a tool your doctor uses to detect eye disease at the earliest stages -- when treatment is most effective -- and to manage disease progression for those already diagnosed. 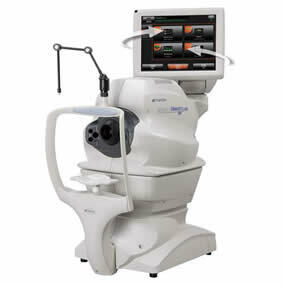 Your eye doctor uses the 3D OCT-1 to clinically assess the health of your macula, optic nerve, and retina. January 2017: Spectera Vision Insurance Now Accepted. Our eye care practice is happy to accept Spectera vision insurance. Find us on your in-network provider list at www.myspectera.com. December 2016: Thank You and Happy Holidays from Your Eye Care Family! As we celebrate the holiday season and reflect on the past year, our hearts are filled with gratitude for our wonderful patients. It is our privilege to be entrusted with your gift of sight ... to know your stories ... watch your children grow ... and to be here for you when you need us. Thank you for your confidence in us to provide you with the highest standard of eye care available, and for your many referrals of friends and family to our office. We wish you peace and joy, and look forward to seeing you in 2017! November 2016: Introducing Optomap® Retinal Scanning. Your Eye Care Associates of Michiana eye doctor has a new clinical tool to help preserve your vision and your health – the Optomap® Retinal Examination. The Optomap® is a quick and painless diagnostic tool that produces a digital scan of your retina – the back of the eye where evidence of macular degeneration, diabetic retinopathy, glaucoma, retinal tears and detachments, and general health problems can be seen. 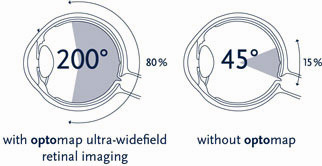 The Optomap® produces an ultra-wide field view of your retina and creates a digital image as unique as your fingerprint for your doctor’s evaluation. To have the Optomap® retinal scan, you simply look into the device one eye at a time and you will see a comfortable flash of light to let you know the image of your retina has been taken. Retinal scanning is comfortable and appropriate for all ages, and can be useful for children, who can sometimes be challenging to thoroughly examine. 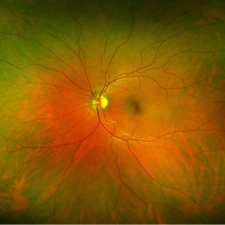 Your retinal images are uploaded to a computer screen for reviewing and discussing with your eye doctor where he or she will confirm the health of your eye or point out areas of concern that might need further evaluation. Since your retinal images are captured and recorded digitally, your eye doctor can retrieve and compare your results with prior exams to detect changes from year to year. Optomap when complemented with (and sometimes without) pupil dilation, improves your doctor's ability to assess the health of your eyes -- something that is important even if you don't need vision correction. November 2016: Eyewear Trunk Show & Savings Event! You're invited to Michiana's biggest eyewear trunk show and savings event! TORY BURCH, PRADA, MIU MIU, PRODESIGN DENMARK, AMPHIBIA FLOATING EYE GEAR, OGI, LIGHTEC BY MOREL, VERA BRADLEY, ZIGGY, JEAN RENO, and launching at this year's show COCO SONG. No appointment necessary. Non-patients and friends welcome. August 2016: Just In ... Nike Vaporwing and Vaporwing Elite Sunwear! Are you Rio ready?! We are! Just in ... a selection of Nike Vaporwing and Vaporwing Elite sunwear. Aerodynamically streamlined ... incredibly lightweight ... superior optics. You don't have to be an Olympic athlete to enjoy the benefits of Nike Vision performance eyewear worn by world-class athletes, and now available at Eye Care Associates of Michiana. The ultra-light Nike Vaporwing Elite ($395). A one-piece shield provides an uninterrupted view and protective coverage. Stop in soon for best selection! 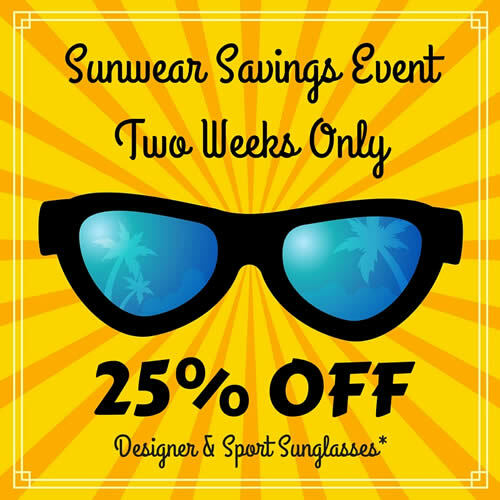 June 2016: Sunwear Savings Event through June 18th! Kickstart your summer with SPECtacular savings! 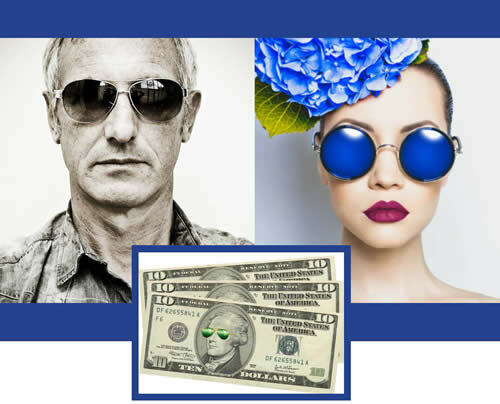 This is an awesome opportunity to save $$$ on a pair of fabulous designer sunglasses you may have been admiring, or to more affordably acquire polarized sunwear that will enhance your sports performance or improve your driving experience. Quality sunglasses are also a great gift idea for dads and grads! But hurry in. This special offer ends June 18th, 2016. Need an updated lens prescription for your sunglass purchase? Request your appointment today. *Special offer cannot be combined with vision insurance or other discounts. Not valid on previous purchases. Other restrictions may apply. March 2016: Save the Date! 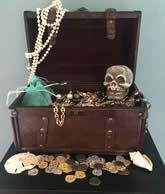 Sunglass Trunk Show & Style Event - MARCH 24th. Get ready to welcome back warmer days in high style! 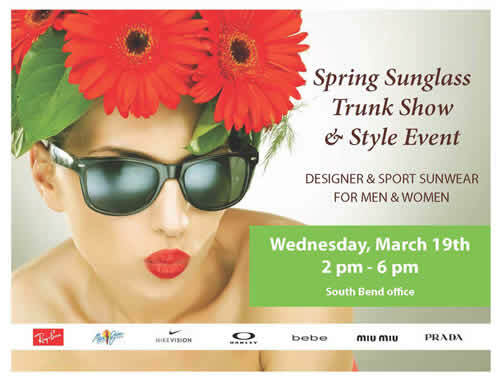 Join us at our South Bend office (17477 Generations Drive) on Thursday, March 24th; 2 p.m. - 6 p.m. for a huge selection of designer and sport sunwear for MEN and WOMEN. Ray-Ban ... Salvatore Ferragamo ... Maui Jim ... Lulu Guinness ... Ted Baker ... Kate Young ... Marchon ... Nike ... Nautica ... and introducing L.A.M.B. and gx by Gwen Stefani! Enjoy giveaways, trunk show treasure savings, refreshments, and the most awesome selection of sunwear! 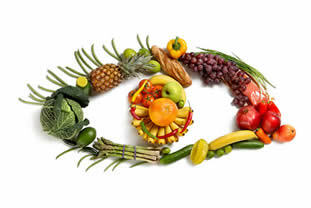 Studies have shown a diet rich in leafy greens, colorful fruits and vegetables, cold-water fish, eggs, and whole grains is essential for bolstering ocular health and tear functioning. But unless you have the time to prepare healthy meals using these foods every day, or want to eat them, you may not be receiving adequate amounts of important nutrients. To provide nutritional support for patients who have been diagnosed with age-related macular degeneration (AMD) – or who are at risk of developing it, and for patients suffering from dry eye, the doctors of Eye Care Associates of Michiana are pleased to offer the EyePromise brand of supplements. These high-quality formulations are designed specifically to promote ocular health, and to address the irritative symptoms of dry eye … and unlike supplement varieties found at drugstores and discount retailers, have been personally evaluated by our eye doctors for their purity and therapeutic benefit. Traci reached out to her eye care professional Dr. Linnea Robbins-Winters who recommended Traci begin taking the EyePromise EZ Tears™ supplement in addition to her prescribed Restasis® regimen. Within two weeks, Traci experienced noticeable symptom improvement, and says that after two months she has gradually gone from uncomfortable, occasional contact lens wear, to comfortably wearing her contact lenses up to five days a week. “If I forget to take my EZ Tears™ supplements, I notice contact lens wear is uncomfortable the very next day,” she says. In addition to EZTears™, Eye Care Associates of Michiana is offering macular health formulas Restore and Restore Zinc Free, AREDS 2 Plus and AREDS 2 Plus Zinc Free multi-vitamin, and Zeaxanthin + Lutein, which are available directly through the practice’s South Bend and New Carlisle offices, or conveniently through a web store found at the home page of www.eyecaremichiana.com. You can be assured of high-quality, natural ingredients. Your overall health and medicine you are currently taking will be considered before a recommendation is provided. A therapeutic dose will be suggested for maximum benefit. Your eye health and/or symptom relief will be monitored. 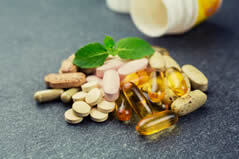 Your supplement purchase may be HSA and FSA eligible if prescribed and purchased during an in-office visit. Reordering is Simple Too! Please visit our web store. 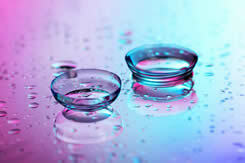 As the day extends into evening, contact lens comfort can diminish. This is especially true if your work or school days require lengthy periods of visual focus, or if you are active with activities long into the evening hours. You know what happens … fatigued eyes start feeling dry and irritated, vision goes from crisp to blurry, and the only way to get relief is to remove your lenses. If this frequently happens to you, you may have decided to wear contact lenses only for special occasions, or perhaps to drop out of contact lens wear altogether. If so, we have good news to share! The doctors of Eye Care Associates of Michiana have received early access to fitting the new ACUVUE OASYS® 1-Day Contact Lens with HydraLuxe™ Technology, a Johnson & Johnson Vision Care product designed to improve all-day vision comfort and performance. Eye Care Associates of Michiana, known in the optometric community for its contact lens specialty, was invited this past September by Johnson & Johnson Vision Care to preview the new OASYS® 1-Day lens at its company headquarters in Jacksonville, Florida. Dr. Linnea Robbins-Winters represented the practice. After learning about the new lens design and technology, she concluded OASYS® 1-Day offered significant comfort improvement. To find out if OASYS® 1-Day lens is right for your vision needs, request your appointment today by calling the South Bend office at (574) 287-0890, New Carlisle office at (574) 654-8806, or by visiting our home page at www.eyecaremichiana.com and clicking on "request appointment." 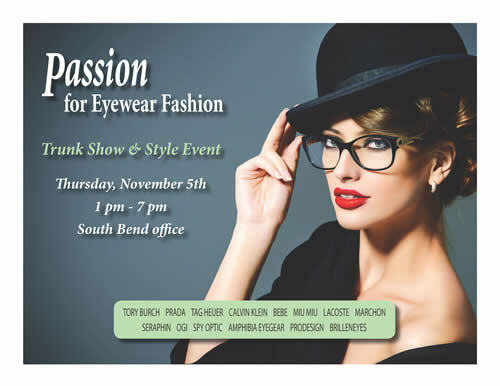 Join us at Michiana's biggest and best eyewear trunk show and style event of the year! TORY BURCH ... PRADA ... TAG HEUER ... CALVIN KLEIN ... BEBE ... MIU MIU ... LACOSTE ... MARCHON ... SERAPHIN ... OGI ... SPY OPTIC ... AMPHIBIA EYEGEAR ... Denmark's PRODESIGN ... and Europe's BRILLENEYES. If you love eyewear fashion, distinctive style, and special event savings, you don't want to miss this one-day event! *Discounts cannot be combined with vision insurance or other offers; only applicable to frames purchased during the event. 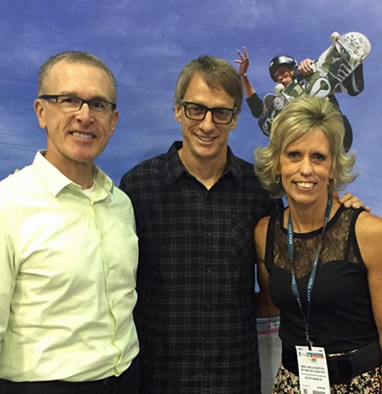 Dr. Tom and Carla Morton attended International Vision Expo in Las Vegas where they met skateboarding legend Tony Hawk, who is introducing his own eyewear collection. 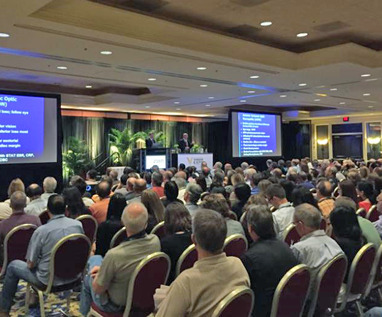 At the Expo, Dr. Morton participated in clinical update seminars and previewed the latest diagnostic technologies. August 2015: Dr. Robbins-Winters Provides Expert Advice for the CDC's Contact Lens Health Week. Dr. Linnea Robbins-Winters was asked to provide professional comment in a joint effort with the Centers for Disease Control and Prevention (CDC) to promote the safe use of contact lenses. Please use this post as a reminder that good contact lens hygiene and regular eye exams are essential for the safest, healthiest contact lens wear possible. Swimming, Showering, With Contact Lens Among the No-No's, Says CDC. 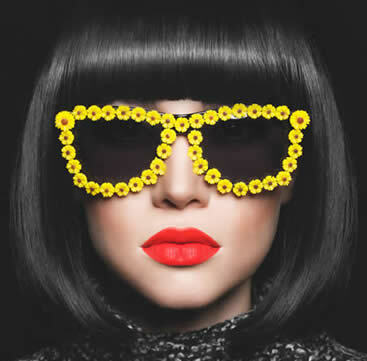 July 2015: Win a Pair of Designer Sunglasses! By becoming a member of our Facebook community, you will be the first to know about exclusive specials, our latest practice news, helpful eye care tips, and new products and services. One winner will be randomly drawn from our Facebook followers and announced on our page August 15th, 2015. CONGRATULATIONS TO OUR WINNER AND FACEBOOK FOLLOWER PATIENT DEBBIE GLAZE! ENJOY ROCKIN' YOUR NEW DESIGNER SHADES! Hope to connect with you soon on Facebook! 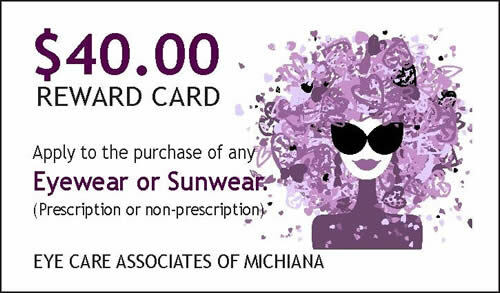 *Official rules: Patients of Eye Care Associates of Michiana/New Carlisle ages 18 or older are welcome to enter to win. Employees and their immediate families are not eligible. 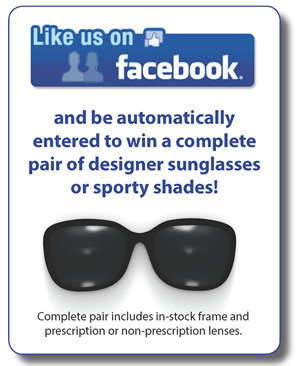 One winner will be randomly selected from existing patients who have liked us on Facebook, and will be awarded their choice of a complete pair (frame and prescription or non-prescription lenses) of designer or sport sunglasses from our in-stock frame inventory. Chance of winning is dependent upon the number of new and existing Facebook page followers. Prize winner is responsible for any additional fees for optional lens treatments or for an eye exam. He/she will have 30 days from day of drawing to claim prize and will be notified by phone. Winner agrees to allow Eye Care Associates of Michiana/New Carlisle, and its affiliates or representatives, to use winner's name and image in promotional content. This promotion is not sponsored, endorsed, administered, or associated with Facebook. Click here to read the latest edition of our practice newsletter! 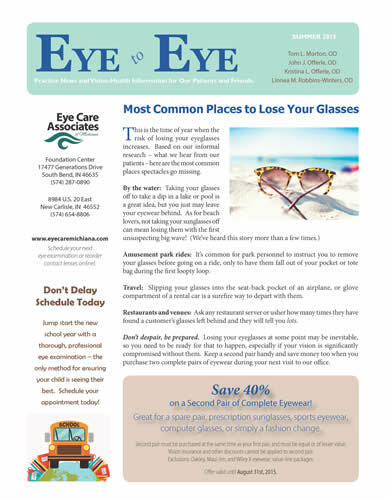 In this issue: Most Common Places to Lose Your Glasses; Correct Your Vision While You Sleep with CRT; Get Relief from Digital Eyestrain; and Your Doctors' Calendars & Happenings. June 2015: ECAM Recieves its 1,000 5-Star Patient Review! 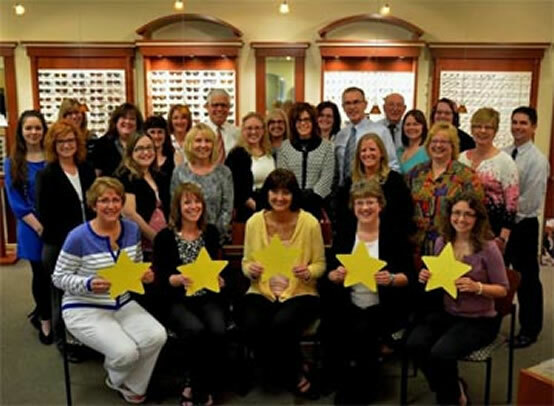 Eye Care Associates of Michiana received its 1,000th five-star patient review!!! Thank you Lynne for letting us know about your most recent visit at our office, and for helping us achieve this important milestone! April 2015: Welcome Back the Sun! 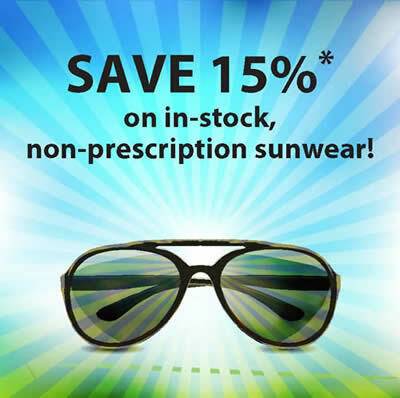 Save 15% on In-stock, Non-Rx Sunwear! Choose from our large selection of fabulous designer styles and sporty performance shades. Click here to print your savings offer, and bring it with you to our office. Offer valid until August 31st, 2015. * Discount cannot be combined with vision insurance or other offers, or applied to previous purchases. Exclusions: Oakley, Maui Jim, and Wiley X eyewear. March 2015: SAVE THE DATE! Wed., March 11th! 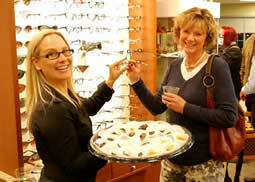 Spring Sunglass Trunk Show & Style Event! Wednesday, March 11th; 2 pm. - 6 pm. For one day only, frame representatives will be at our South Bend office to present their full sunglass collections for MEN & WOMEN, including designer and sport sunwear from PRADA, Salvatore Ferragamo, Miu Miu, Tory Burch, Nautica, NikeVision, Maui Jim, Oakley, and Ray-Ban. 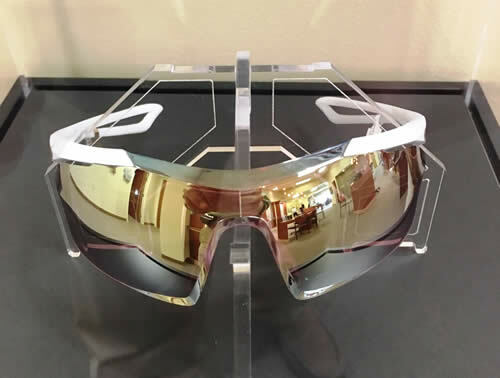 A representative from Shamir will also be onsite to discuss the company's new high-definition, digitally surfaced lenses that are available for your new eyewear and prescription sunglasses. Join us for refreshments, giveaways, and lots of fun! Receive $30.00 in TRUNK SHOW BUCKS to apply to your sunwear purchase just for attending! We're ready to welcome back the sun and know you are too. See you March 11th; 2 pm - 6 pm! No appointment necessary. Friends and non-patients welcome. February 2015: Dr. Morton's Daughter Signs Letter of Intent to Play Basketball at Huntington University. Casey Morton, a senior at Penn High School and the youngest child of Dr. Tom and Carla Morton, signed a letter of intent in December to play college basketball for Huntington University near Fort Wayne. The 5’10” shooting guard capped off her high school career by scoring five 3-point shots in a row on senior night. Casey plans on becoming a nurse practitioner and was drawn to the University’s highly regarded nursing program, as well as its women’s basketball team headed by Coach Lori Culler. The Mortons are very proud of their daughter’s hard work and dedication on and off the court. Casey currently holds a 3.98 GPA and is a member of the National Honor Society. In her spare time, she is a volunteer at Reins of Life and Miller’s Merry Manor. She is also actively involved in Fellowship of Christian Athletes, Big Brothers/Big Sisters and Memorial Hospital Mini-Medical University. 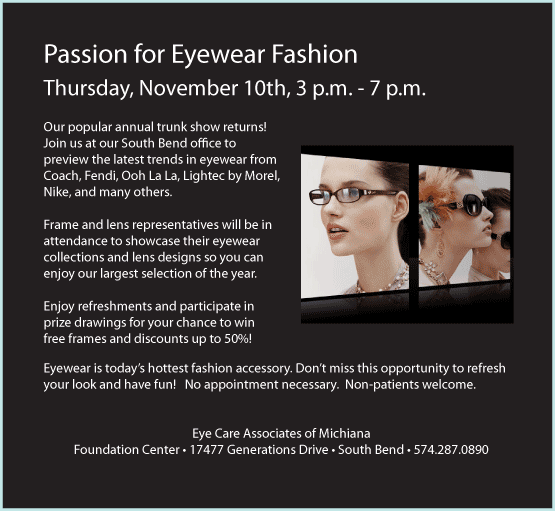 November 2014: Thank You for Making Our"Passion for Eyewear Fashion" Trunk Show & Style Event a Huge Success! 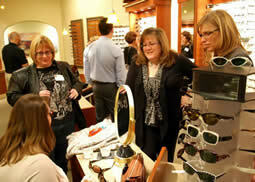 Thanks to all who joined us for PASSION FOR EYEWEAR FASHION, our annual trunk show and style event for MEN & WOMEN. It was the largest and most successful show we have ever hosted! Follow us on our Facebook page to be the first to know about upcoming eyewear fashion events, special offers, and promos. Click here to read the latest issue of our practice newsletter. We've Reached a Milestone ... Thank You! July 2014: Thanks to YOU, We've Reached a Milestone! Thanks to you, we've reached a milestone --500 Five-Star Reviews! When asked about your patient experience after visiting our office, more than 500 of you (9 out of 10) rated our care and service to be five stars -- the highest rating possible! 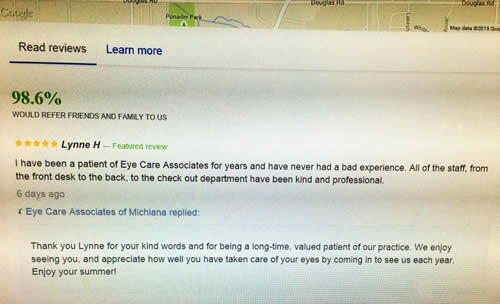 Your comments and reviews have served as great reminders of your trust in our doctors and staff to provide you with the highest standard of eye care available. We also thank those who offered suggestions for improvement. We appreciate your candid feedback, and for allowing us the opportunity to earn your five-star rating in the future. If you would like to read our reviews, please return to the home page, scroll to the bottom, then click "Read our reviews." June 2014: Announcing our Reward Card Program! We appreciate your loyalty and trust in our care and thought you should be rewarded! This month we launched the Eye Care Associates of Michiana/New Carlisle Rewards Program by introducing two great savings opportunities. Refer a new patient or a new household to our practice and we will automatically send you a $40.00 Reward Card! Reward may be applied toward any eyewear or sunwear (prescription or non-prescription) purchase. Multiple rewards may be combined -- so the more you refer the more you save! Make sure the new patient you referred lets us know you sent them here. Reward Card expires 90 days from date of issue. Only applicable toward uninsured optical purchases. One Reward Card awarded per new patient, or one per household. Buy an annual supply of contact lenses from our office and receive a $30.00 Reward Card toward your purchase of non-prescription sunglasses! 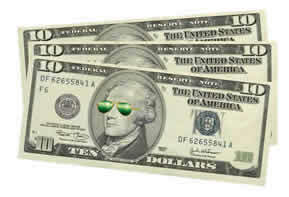 This is a great way to save on a pair of designer sunglasses you may have admired at our office. 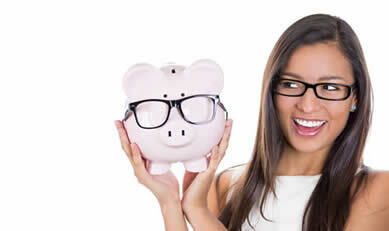 And remember ... annual supply purchases of contact lenses often qualify for money saving rebates too! Reward Card expires 60 days from date of annual supply purchase. Can not be combined with vision insurance. Start being rewarded today! Refer a new patient or household to our office, or stop in or call our office to order your annual contact lens supply. 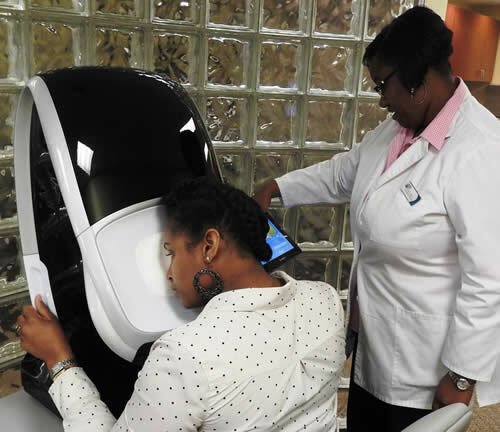 Eye Care Associates of Michiana became an early adopter of the Diopsys® NOVA - VEP/ERG Vision Testing System, a breakthrough technology that evaluates how your eyes communicate with your brain. VEP/ERG tests are used to aid in the diagnosis and management of amblyopia, traumatic brain injury, stroke, multiple sclerosis, glaucoma, macular degeneration, diabetic eye disease, and to monitor the effects of medications that can interfere with ocular health. When light from an image enters your eye, it is converted into electricity at the retina and travels through the optic nerve and other pathways to the part of your brain that processes vision. This testing allows your doctor to assess the strength of the signal reaching your visual cortex and how fast it travels there to determine the degree of visual impairment. VEP/ERG tests are non-invasive and painless, and only administered when deemed necessary by your eye doctor. After serving the vision needs of our New Carlisle patients for 24 years, office manager and certified paraoptometric assistant and technician Kathy Belsaas is retiring. Her last day at the office will be May 2nd. Kathy has been the welcoming face of our New Carlisle office since 1990, when she began working alongside Dr. Tom Morton. "When I first started working here, we had about 50 patients and were open only two days a week," says Kathy. "We now serve five thousand patients, have three doctors, and are open Monday through Friday. Our success is truly a reflection of our wonderful patients referring us to others, and how much high-quality eye care and personalized service are appreciated." Dr. Linnea Robbins-Winters, who along with Dr. Morton and Dr. Kristi Offerle provides patient care at the New Carlisle location, describes Kathy as the heart and soul of the office. "She does it all -- office management, pre-testing, optical service -- but most importantly, Kathy has been a wonderful ambassador for our practice," says Dr. Robbins-Winters. Kathy resides in New Carlisle with her husband and is the mother of two grown children. After receiving her Bachelor of Science degree from Indiana State University, she was a home economics teacher for eight years. She then became a stay-at-home mom and re-entered the work force by joining Eye Care Associates of New Carlisle when her daughter Kari began first grade. That little girl now has two children of her own, which is one of the reasons Kathy made the decision to retire. "I absolutely love my job," she says. "However, my husband has been retired for the past two years and we have three grandchildren and another one on the way. I wanted the flexibility to pick up at a moment's notice to see them during the week, and also to travel with him." When asked about the hardest part of retirement, Kathy says it will probably be when she drives past the office. "It will be a strange feeling for a while," she says. "My car will automatically want to make the turn into the parking lot, and I'll have to remind myself to drive past it." Although Kathy will no longer be at Eye Care Associates, patients can be assured they will continue to receive the same level of knowledgeable service and vision care they have grown accustomed to. Doctor care remains the same, and we're fortunate to have team members who have learned from Kathy to make the transition go smoothly. Get ready for the return of the sun by joining us at South Bend's biggest and best Spring Sunglass Trunk Show & Style Event! For one day only, frame representatives will be at our South Bend office on March 19th (2pm - 6pm) to present their full sunglass collections for MEN and WOMEN. Try on distinctive eyewear styles from PRADA, MIU MIU, BEBE, MAUI JIM, RAY-BAN, NIKEVISION, and OAKLEY. Join us for refreshments, giveaways, and lots of fun! Receive $30.00 in TRUNK SHOW BUCKS* to apply to your sunwear purchase just for attending! Non-patients welcome so bring a friend! Dr. John Offerle returned in February to his favorite mission spot – San Pedro Sula, Honduras – to volunteer his professional services to hundreds of area residents who otherwise would not have access to quality eye care. He was joined by his wife Laurie, who has made it a yearly tradition to accompany her husband and also voluteer. This is the 12th mission trip for the Offerles as part of the Indiana chapter of VOSH (Volunteer Optometric Services of Humanity). Photos: 1. Laurie Offerle stands next to the line of patients that began forming at 4:30 a.m. 2.) The line continues inside the school yard for free eye exams, glasses, and sunglasses. 2. A patient is appreciative of her eye exam and new sunglasses. 3. A recipient wants to thank our ClearVision Optical Representative Pam Kirts for her donation of quality sunglasses. 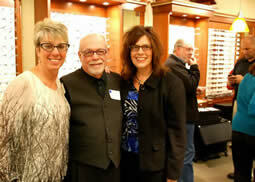 November 2013: Record Attendance at This Year's "Passion for Eyewear Fashion" Event. 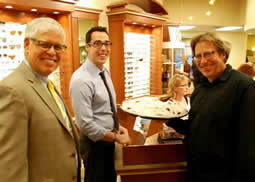 Another exciting edition of our annual Passion for Eyewear Fashion style event and trunk show is now behind us. 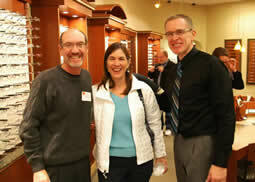 We had a record number of attendees, which confirms the word is out that this is THE best eyewear event in Michiana! As always, a great selection of our best fashion eyewear, big discounts, financing available through Care Credit, raffles, a lot of fun and great refreshments. For pictures of Passion for Eyewear Fashion 2013, visit our Facebook page. Thanks to everyone who attended, to our fantastic staff for making it happen, and to the reps who brought their best stuff! And new to our event this year was Sujata Bauters from Ciba/Alcon who provided single use Dailies Total One contact lenses to those whose prescription prevents them from seeing their eyewear selections without correction! And as always, thanks to our friends, Mark and Suzie Baker, for catering our event with fantastic refreshments! We look forward to seeing you all at next year's event! Join us at our annual PASSION FOR EYEWEAR FASHION style event for the largest frame selection and savings of the year! Enjoy discounts up to 50%, prizes, raffles for free frames, and refreshments! Frame representatives will showcase their exclusive trunk show collections, including luxury eyewear from PRADA, Valentino, Miu Miu, Salvatore Ferragamo, and Versace; unique looks from OGA, Classique, Frieze, and Lightec by Morel; and colorful classics from COACH, Nine West, Marchon, and LACOSTE. For contact lens wearers, we will be introducing the new Alcon "Total 1" daily disposable lens at the event. Hope to see you there! No appointment necessary. Non-patients welcome. The Affordable Care Act (ACA) is changing health insurance. This includes adding new preventative care and essential health benefit requirements. Starting in 2014, vision care is considered an essential benefit for children aged 18 and younger whose parents or guardians get insurance through individual or small-group plans through the exchanges or directly from a health insurer. The law does not mandate this coverage for adults. Pediatric vision care as part of the essential-benefits requirement will typically include one routine eye examination per year; one pair of standard eyeglass lenses or contact lenses per year; and one frame every year. This requirement does not apply to health plans offered by larger employers, or standalone vision plans. However, many health insurers include pediatric and adult vision care at a combined premium rate with medical benefits. Please check your plan or speak with your HR representative for details regarding your specific vision care coverage. Comprehensive vision examinations for children are essential in facilitating the early detection and treatment of vision impairments that may not be correctable later in life. The Affordable Care Act pediatric vision benefit makes it easy for many families to ensure their children have a healthy start in life, and aren't left behind in academics or activities due to undetected and uncorrected vision problems. Members of our eye care team, including three generations of Offerles, enjoyed a beautiful fall afternoon while representing Eye Care Associates of Michiana at the 4th Annual Notre Dame Vision Walk that was held Sunday, October 13th. This fundraising event is for the Foundation Fighting Blindness (FBB), a national research organization that acts as a world leader in providing funds for the research and development of treatments and cures for those affected by retinal degenerative diseases. The Notre Dame Biology Club was responsible for bringing Vision Walk to campus and did a great job in organizing the event. 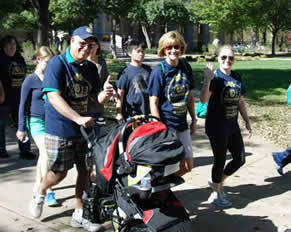 For more photos of our ECAM team at Vision Walk, visit our Facebook page. 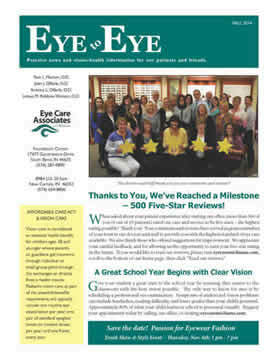 Read the latest edition of our practice newsletter Eye to Eye, by clicking here. Kids' Eyewear Packages - (frames and lenses) begin as low as $79.00! Packages include impact-resistant polycarbonate lenses. Family Savings Event* - Schedule your children's eye appointments together and save 50% off the second and third pediatric eye examinations. *Children must be 13 years of age or younger. Not valid with vision insurance or other discounts. Offer expires October 15th, 2013. April 2013: Discover Natural Relief for Dry Eyes! Eye Care Associates of Michiana is pleased to offer patients who experience chronic eye dryness another treatment option– Dry Eye Omega Benefits®. This natural omega-3 is the first nutritional supplement proven to address Meibomian Gland Dysfunction, a common root cause of chronic eye dryness. By taking an omega-3 supplement, you provide your body the necessary nutrients for optimal tear composition to relieve the symptoms of irritation, scratchiness, or redness. Dry Eye Omega Benefits® from PRN is formulated with a high concentration of the anti-inflammatory Omega-3, EPA (eicosapentaenoic acid) in its natural triglyceride form, combined with Vitamin D3 for additional comprehensive health benefits. The formulation is molecularly distilled in a pharmaceutically licensed facility and independently laboratory tested for quality and purity. The doctors of Eye Care Associates of Michiana offer expertise in dry eye diagnosis and treatment. To schedule an appointment for a dry eye evaluation, please call our office at 574.287.0890 (South Bend) or 574.654.8806 (New Carlisle). Dr. John and Laurie Offerle returned to San Pedro, Sula, Honduras, for their annual mission trip with Volunteer Optometric Services to Humanity (VOSH), February 24 – March 2nd, 2013. 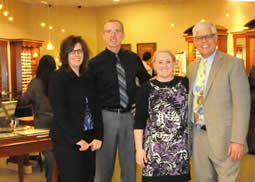 This year they had the pleasure of being joined by Eye Care Associates of Michiana’s bookkeeper Joy Baiz. This was Joy’s first mission trip. Through VOSH mission trips, underserved populations receive access to eye care and glasses through the volunteer efforts of doctors and optical staff. The primary mission of VOSH/International is to facilitate the provision and the sustainability of vision care worldwide for people who can neither afford nor obtain such care. Photos (left to right): 1.) The line at 7:00 a.m. for eye examinations. 2.) Security outside the eye care clinic. 3.) Dr. Offerle examining a school girl. 4.) Joy helping with patients. March 2013: New Finishing Lab Arrives at South Bend Office. Eye Care Associates of Michiana has invested in a state-of-the-art finishing lab for in-office processing of eyeglass lenses. A finishing lab takes a prescription lens and prepares, or grinds it, to a specific shape to fit the selected frame. By choosing to have a finishing lab in our office, we enhance your patient experience in two ways – we can achieve more timely delivery of your selected eyewear, and have more control of the quality of the workmanship and detail that goes into crafting your glasses. Precision and efficacy of the lenses are just as important to our patients as the beautiful and unique frames we offer,” says Dr. John Offerle. “The enhanced finishing quality is made possible by a combination of our new equipment and our professional lab staff. The best equipment doesn’t deliver the best quality unless you have a well-trained optical team with lab experience, which we have.” he adds. 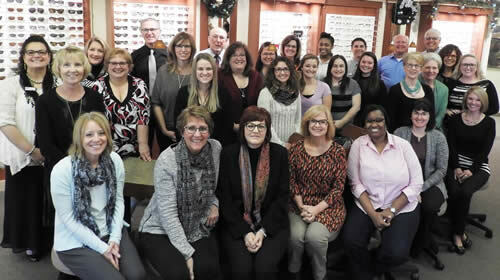 The opticians of Eye Care Associates of Michiana are certified by the American Board of Opticianry, and are either graduates of optician programs from Ferris State College of Optometry or Indiana School of Optometry. “Our lab staff’s education and experience combined with their desire to deliver an excellent product, give our patients access to the best optical team in the area!” says Dr. Offerle. The finishing lab is located in our South Bend office at Foundation Center, but also serves patients receiving care at our New Carlisle office. December 2012: Give the Gift of Good Vision. Are you looking for a unique and valuable gift idea for the holidays? 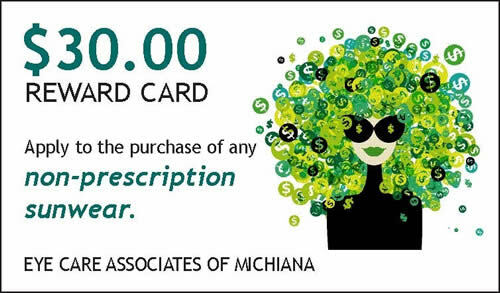 Eye Care Associates of Michiana offers gift certificates at both office locations, and in the denomination you specify. A gift certificate can provide a loved one a new pair of glasses, the college student a supply of contact lenses, your spouse a pair of designer sunglasses or sports eyewear, or the hard-to-buy-for recipient a unique and thoughtful gift. The holiday season is fast approaching. Stop in soon to purchase your certificates. November 2012: Use It Before You Lose It! Smart End-of-Year Moves to Make Now. * Make sure your eye examination is up to date. 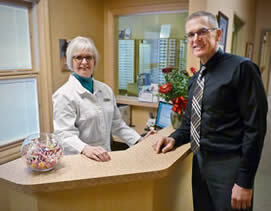 * Visit our office for a new pair of glasses or prescription sunwear. * Order extra boxes of contact lenses. Remember ... you earn your benefits, so make the most of them! You can also save money if you have a medical eye condition and have already met your Medicare or medical-insurance deductible for 2012. Schedule your eye checkup before the end of the year. The 2012 edition of our Passion for Eyewear Fashion event is now history! We had a great turnout and a lot of fun! Our guests enjoyed discounts from 20% to 100%, and giveaways including gift cards, t-shirts, and eyewear cleaning cloths. A special thanks to our great frame reps who joined us. Chris McCann representing Versace, Prada, D&G and Dolce and Gabbana; Kirk Kinniry with Marchon New York, Bebe, Nike and AutoFlex; Dan Richardson representing OGA, Koali and Lightec; and Jack Gill for bringing in OGI and Seraphin. Our rep from Zeiss lenses and diagnostics, Karen Wendorf, was there to assist with our I-Terminal that we use for computerized measurement of progressive lenses. Thank you Karen for providing free lens cleaning cloths to our guests. Here are some highlights from the night. Hope to see you next year! October 2012: Save the Date! 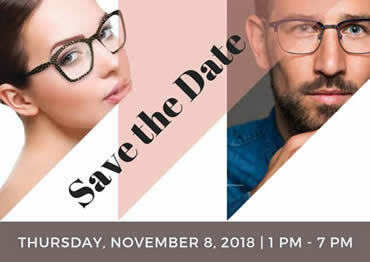 "Passion for Eyewear Fashion" Event - Nov. 8th. Our annual trunk show event returns with new collections and exclusive savings! One day only! Thursday, November 8th; 1 pm. - 7 pm. ; South Bend office. Enjoy refreshments and discounts up to 50%! Participate in prize drawings for your chance to win free frames. No appointment necessary. Non-patients welcome. For more information, click here. Why Trust Us to Make Your Glasses? July 2012: Family Savings Event! Bring in the kids for their annual eye checkups and save 50% off the second and third pediatric eye examinations! Children must be 13 years of age or younger, and scheduled together. Not valid with vision insurance or other discounts. Offer expires September 30, 2012. Due to popular demand, our Family Savings Event has been extended to October 15th! Alex Morton signs her Letter of Intent to play basketball at Western Michigan University. She is accompanied by her parents Dr. Tom and Carla Morton, Penn High School Head Coach Kristi Kaniewski and Assistant Coach Hassan Abdullah. Dr. Tom Morton and his wife Carla are proud to announce their daughter Alex has committed to playing for the Western Michigan Lady Broncos Division 1 basketball team next fall on scholarship. Alex, a 5-9 guard and graduate of Penn High School, has been playing AAU basketball since age 7. Her accolades this past year have included selection as an Indiana All-Star, First Team All-State selection, and Northern Indiana Conference's MVP. While playing in the Indiana All-Star Series in Indianapolis this June, she was announced as the recipient of the John Wooden/MCL Citizenship Award. According to officials, the recipient is chosen for their scholarship, community involvement, school citizenship, extra-curricular activities, and outstanding basketball skills. Alex is the first girl from Michiana to win the Wooden Award in its 21-year history. February 2012: Dr. Offerle Returns from Honduran Mission Trip. Dr. John Offerle traveled to Honduras in February where he participated in his ninth mission trip as part of VOSH (Volunteer Optometric Services of Humanity). He was joined by his wife Laurie and several other professionals, who provided free eye care services for approximately 2,500 patients. Eye examinations and eyeglass distributions were performed in a makeshift clinic located in the small town of Tela, about an hour drive from San Pedro Sula, the country's second largest city. Clear Vision Optical, a provider of brand-name frames, donated 100 pairs of sunglasses to the mission through Eye Care Associates of Michiana. We thank them for their important support. TRIP NOTES: According to Dr. Offerle ... "Next time you fly, pay attention to the pre-flight instructions." He and his Laurie lost cabin pressure and had to return to Atlanta to change planes for their trip to Honduras. They managed their stressful situation with some picture taking. Eye to Eye: Practice news and vision health information for our patients and friends. Click here to open the newsletter in pdf format. 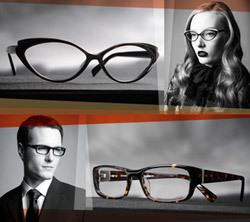 October 2011: "Passion for Eyewear Fashion" Event Returns! If you currently wear contact lenses and would like to avoid using reading glasses, or if you have been unsatisfied with previous multifocal or monovision contact lenses for presbyopia, the new Duette Multifocal Hybrid Contact Lens may be an excellent option for you. Because of Eye Care Associates of Michiana's contact lens expertise, we are one of only 100 practices nationwide to have received exclusive access to this special new lens before it becomes widely available. 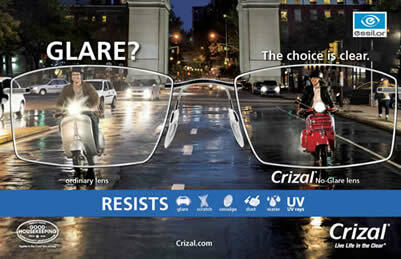 Try the Synergeyes Duette™ Multifocal Lens at No Risk! Eye Care Associates of Michiana is offering a guaranteed fit or your money back on your Duette™Multifocal contact lens purchase. (Excluding exam and fitting fees.) Please speak with your eye doctor for more details. Our Dr. Linnea Robbins-Winters was contacted by WNDU-TV, Channel 16 News, to discuss the InfantSEE® program – a public service initiative that provides a one-time eye assessment for infants during their first year of life at no cost to families, regardless of ability to pay or access to insurance coverage. To learn more about this program and view the August 18th news segment, click the "play" button below. The front page of the July 25th edition of the South Bend Tribune featured Dr. Linnea Robbins-Winters discussing the importance of early detection of vision problems in children. She used the opportunity to promote the availability of free comprehensive eye and vision assessments for infants between the ages of 6 months and 12 months through the InfantSEE® program. Read more. 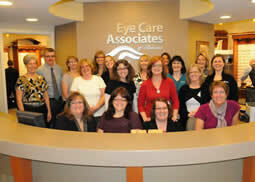 The doctors of Eye Care Associates of Michiana have been participants of the program since it began in 2005. To schedule your infant's free eye examination, please call our South Bend office at (574) 287-0890, or our New Carlisle office at (574) 654-8806. 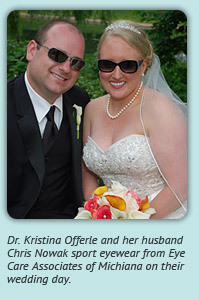 June 2011: Dr. Kristina Offerle Weds! On June 11th, Dr. Kristina Offerle married her high school sweetheart Chris Nowak at St. Joseph Church in South Bend. She was walked down the aisle by her father Dr. John Offerle, who later danced with his daughter to My Wish by Rascal Flatts. Dr. Kristina and Chris, a teacher at LaPorte High School, celebrated the day with 300 family members and friends at the Century Center. After enjoying a honeymoon in beautiful Montego Bay, Jamaica, they returned to their home in South Bend. Seraphin is an eyewear line of quintessential vintage style. Seraphin hearkens back to a time and place when definitive sophistication and the power of romance drove the fashion world toward a distinctive aesthetic that's right now. The collection consists of ophthalmic frames and sunglasses manufactured in Japan from titanium and Italian zyl. Laser engravings, crystal accents and precise, durable hinges are used to maximum effect in each design. Sunglass lenses are polarized with AR coatings. To view the collection, visit www.ogiframes.com/seraphin. The Ogi Eyewear family has made a name for itself by crafting high quality, on-trend, frames with the emphasis on affordable luxury. Using intriguing colors, simple shapes and top-of-line materials, the distinct frames are bold, yet wearable. Women and men styles are available. To view the collection, visit www.ogiframes.com. Eye Care Associates of Michiana is now offering Shamir Relax™ -- a new eyeglass lens for fatigued eyes. This lens is specifically designed for patients who spend the majority of their workday reading and using the computer to complete tasks. These activities force the muscles in the eye to focus in and out repeatedly throughout the day. This routine performance of the eye's muscles, referred to as prolonged accommodation, results in visual fatigue. The Relax lens incorporates a special design in the lower part of the lens so the eye muscles are not forced to work as hard at accommodation, providing needed relief from visual fatigue. Shamir Relax™ is suitable for single vision patients (those who don't require a bifocal or a multifocal lens), and for non-prescription wearers who suffer from visual fatigue. Ask our optical experts also about Shamir Office™, another new occupational lens that is helping our patients enjoy clear, comfortable vision throughout their work day. Dr. Tom Morton was asked to assist the First® Lego® League Painbusters team comprised of students from Northpoint Elementary and Discovery Middle School in Granger. FIRST® LEGO® League (FLL) is an international robotics competition for elementary and middle school students. Its purpose is to ignite enthusiasm for discovery, science and technology. A new challenge is announced each year that focuses on a different real-world topic related to the sciences. The 2010 FLL challenge was a biomedical engineering theme. Guided by a coach and mentors, the kids research and solve a real-world problem, present their research and solutions, and build an autonomous robot using engineering concepts. The FLL Painbusters team made it to the state-level competition with their project theme of helping people overcome color blindness using technology. The team came up with some very creative solutions, including an electronic device that would sense color of an object and convert it to speech. Congratulations to the FLL Painbusters team for a job well done! Our Dr. John Offerle traveled to Nairobi, Kenya, for his annual VOSH (volunteer optometric services for humanity) mission trip. Along with several other eye care professionals and optometric students, he provided eye care and refurbished eyewear to residents of the second largest slum in Africa, and third largest in the world. Dr. John Offerle – Optometrist of the Year. "Mom … when can I get contacts?" 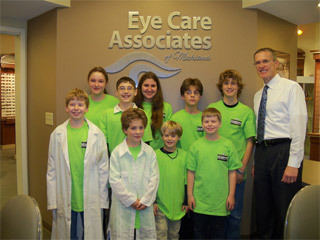 April 2010: Dr. Offerle Named "Optometrist of the Year"! 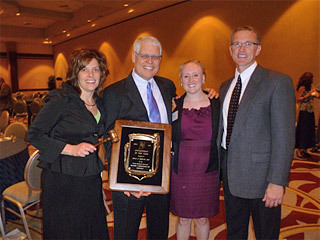 Eye Care Associates of Michiana's Dr. John Offerle received Indiana Optometric Association's highest honor when he was named Optometrist of the Year at its annual convention this past April. The award is bestowed upon the member who has demonstrated not only contributions to his or her profession, but also service on behalf of the visual welfare of the public and service to the community at large. Dr. Offerle was commended by the association for making seven trips to Honduras, where he has donated his services to people who otherwise would not have access to proper vision care. He has also donated his time preparing and serving meals, and providing free eye examinations through organizations such as the Little Flower Church and the Sister Maura Brannick Health Center. In reference to his commitment to his profession, he has served state and local optometric associations in official capacities, organized chapter events, worked as a legislative representative, and promoted optometry as a career choice by speaking at local high schools. April 2010: Dr. Robbins-Winters Elected President of IOA. 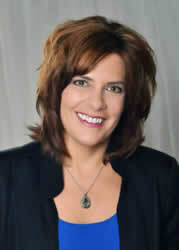 Dr. Linnea Robbins-Winters has been elected the new president of the Indiana Optometric Association (IOA). She began her one-year term with an induction ceremony at the group's annual spring meeting. The IOA is a 760 member, non-profit association serving the interests of Indiana optometrists and their patients since 1897.